One of the things I don’t love so much about New York (and there aren’t many) is that it can be tricky to find a good, authentic pub without going to an O’Grady’s Irish Tavern. Unlike being in London where it is difficult to get away from the quintessential pub, NY is a different story unless you know where you are going. 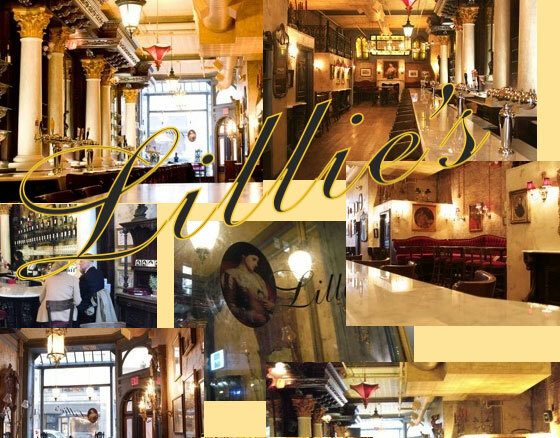 What is nice about Lillie’s is that it is technically a pub but it has been styled to appear to be high-end, stylish, antiquey and totally British without actually being any of those things. Celebrating the life of this fabulous woman, it is popular for its beers (there are over 30), whiskeys (over 50) and great food. Pop in when you are next in Manhattan and fancy seeing this crazy place with your own eyes. While the furniture has been shipped from Lillie’s home to its new destination in Manhattan, Lillie’s Victorian Bar successfully tries to make beer boutique.